Frequent travellers will no doubt identify with these hilarious* games you get to play when you travel and stay in hotels a lot, particularly in boutique funky hotels. Tell me your favourites in the comments below. Where Have They Hidden The Iron? It’s usually in the hanging closet. But not today! No, it’s time for a game of hide-and-seek as you try to figure out if there is supposed to even be an iron in the room, or if some desperate soul has stolen it. Apparently this happens. No, I don’t know why you’d bother, either. Pro-tip: take a pillowcase off a pillow for a test iron before using the iron on your best shirt. Assuming you eventually find it. Under the mini-bar. Of course it is. How Does This Lamp Work? What kind of lamp switch will this one have? Exciting mysteries await! Why do all the lamps work differently? Some have knobs you have to twiddle in just the right way to turn on, partly on, mostly off, and off. Or a switch, which could be on the base, the cord, near the bulb, or on the stem. Maybe even somewhere else. Spend more minutes than you care to admit hunting for the way to do it on this lamp, which is of course completely different to the other three lamps in the room. There is a bonus mystery here, which is Why Do Hotels Not Have Ceiling Lights In The Main Section? I suspect it has something to do with re-modelling, particularly if the particular property gets sold to a different chain. You can just swap out all the furniture and voilà you’re no longer in a Hilton, it’s now a Marriott. Why would we label the switches? We might completely redo all the power cabling in the room at any moment, and then we’d have to relabel everything. 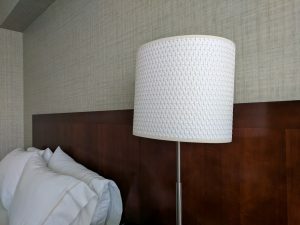 It’s much more convenient for our guests to try all the switches in turn to figure out if they turn on the hall light, the light near the bed, or another, mystery light that doesn’t work unless you also twiddle the knob on the lamp it’s connected to. Why Can’t I Charge My Phone Near The Bed? Why should there be a power outlet near the bed? If there is a power outlet near the bed, it will be used by a lamp that is the only lighting for the main part of the room, without which you will have to wander around the room using only the light from the TV to guide you. Or an alarm clock. Not just a regular clock, because everyone has phones with alarms in them these days, and you can call downstairs for an alarm call, no it specifically has to be an alarm clock. How Does This Shower Work? Turning me on without turning the little knob in the middle makes water squirt all over the bathroom. Surprise! Creativity is an excellent thing, but not when it comes to regular household items like taps. I don’t want to solve a puzzle when I am desperate for a shower to wash off 24+ hours of travel grime. 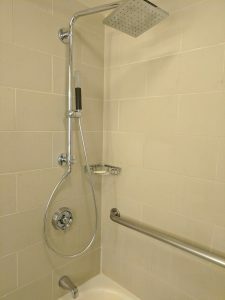 I don’t want to have to guess at the magical combination of twisting, pushing, pulling and pointing to get warm (not scalding hot, not ice cold, just warm) water coming out of a showerhead that is pointing over the bath and/or shower area. Bonus points if it joins up with the Which Switch Does What game. Who Uses The Alarm Clock? If you set the alarm and don’t turn it off before you leave, the next guest likely won’t notice until it goes off at 4:30am, very soon after they finally got to sleep because they’re from a different timezone and have jetlag. Whose Pubic Hair Is That? What Is This Stuff On The TV Remote? Why Are There Five Channels Of Hotel Marketing? Why must I skip over between two and seventeen channels of in-hotel marketing and “What To Do Around Town” infotainment specials to get to the real TV channels? Why is there a channel dedicated to beachbodies? Surely that’s just your regular body that you have taken to the beach? Do people have hotel bodies? Work bodies? Where The Hell Is This Stupid Iron bodies? I can kind of understand that there might be a few people who prefer to sit through an endless loop of video to find out what they can do in the hotel instead of picking up the guide in the room and reading it. Who doesn’t love to watch ten minutes of video to get information you can read in 45 seconds? I assume these are the same people who have decided all written journalism should pivot to video.